Pigeon pâté is a delicacy that is often reserved only for hunters and the people who know them. Pigeons are not often found at the local grocery store; they are either considered a specialty item or they are privately hunted in the autumn. You may also find them labeled as squab. These birds have a flavor that is similar to that of dove and are often hunted at the same time. Some pigeons are protected so be sure that you check with the state you will be hunting in to determine which type is lawful to bag. Eating pigeon is more popular in Great Britain than the United States. Pigeon pies and stews are warm comfort foods on cold, blustery nights. Pâtés can be described as being the sophisticated cousin of the American meat loaf and are often made of several parts of the game ground together before cooking. Pigeon pâté generally consists of pigeon breasts, pigeon and chicken livers and a variety of herbs and spices. You can serve this delicacy encased in pastry or in a loaf as you prefer. Assuming that the bird has been cleaned and dressed you will still want to make sure that the meat is clean and ready to be turned into an amazing pâté. Check the meat for bird shot; biting into a piece of shot can chip or even break a tooth. It is an unpleasant experience that will reflect badly on you as a cook. Feel the meat with your fingers, looking for anything that feels like gravel. Take it out and discard it before proceeding with your recipe. If you are cooking an older bird or you suspect that it might be gamey, salt it for a day or soak it in a brining solution before continuing with your recipe. 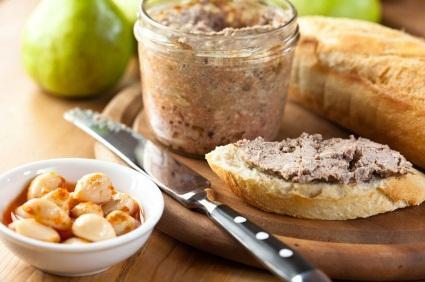 This recipe is for a simple but delicious pâté to serve 12. Rinse the salt off of the meat carefully. Heat the butter in a pan until melted and beginning to foam. Add the sage and chopped pigeon breasts and cook for about 4 minutes, stirring. Remove the pigeon from the pan and add the chicken. Add the vinegar and cognac. Add the pigeon breasts and liver mixture to a food processor. Pulse until finely ground and add melted butter in a steady stream. Add the cream and mix thoroughly. Taste and adjust seasoning, spoon into a serving dish or mold. Add a layer of melted butter and chill overnight. While it may be difficult to find pigeon pâté recipes, you should remember that you can usually interchange pigeon and dove in any recipe. Pâtés are pretty basic so don't be afraid to experiment with the seasonings to make your pigeon pâté unique. The Field offers directions on how to make pigeon pate. Shooting UK shares a smoked pigeon pate recipe. Create an elegant ambiance by serving a squab or pigeon pâté at your next dinner party or get together. It isn't a difficult dish and the delicious flavor will impress your guests.This versatile dish is also an excellent addition to a romantic picnic in the country.